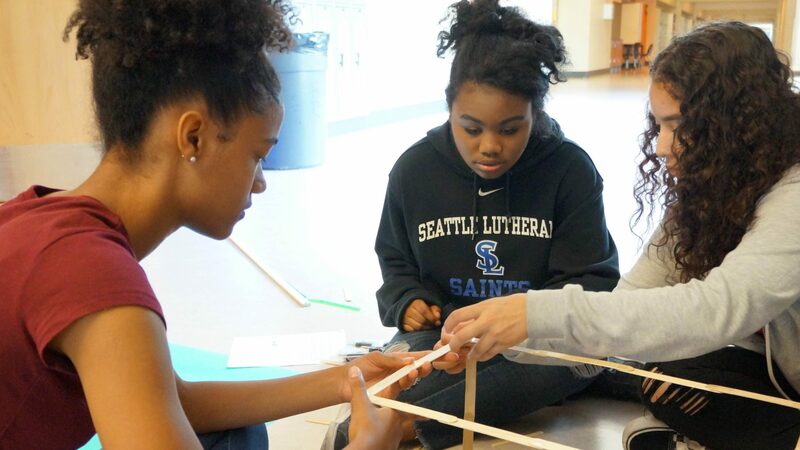 This year, Seattle MESA hosted the Minute to Win It math challenge at the University of Washington Math Day. High school students from many different local high schools participated in the challenge. The classroom overflowed with students; in fact, the Minute to Win It challenge was so popular, Math Day ran out of tickets for the activity. In the challenge, students grouped up into teams of 4 to be the first team to answer a math question. After a team answered correctly, the teams would have one minute to complete some sort of task ranging from balancing golf balls to catching pencils. The event excited students about math by promoting friendly competition and overall, it was fun for the students to do outlandish challenges while testing their math knowledge. There was lots of energy in the room, with students chanting and cheering for their teammates. It’s rare to see a group of high school students this excited about math, but hopefully this experience keeps them moving forward in math!